I was putting books in a box when the old letter slipped out onto my lap. I’m not much of a pack rat but must have stuck this little gem away a very long time ago. It was a letter from my “Pop”, my grandfather, written to me when I was just five years old. He was a working class man, a mason, a depression era guy, with deep faith and strong sense of family. I can remember how we sang from hymn books together for hours. He was a gentle nose wiper and always had a hanky in his back pocket which my mom thought was kind of gross. My sister and I would play hairdresser with his thick white hair, he didn’t even mind about a hundred bright clips and ribbons in his shiny mane. He was a legacy kind of man, with a strong presence and a wise word. He didn’t write letters very often, maybe on some level I knew it was special…even then. 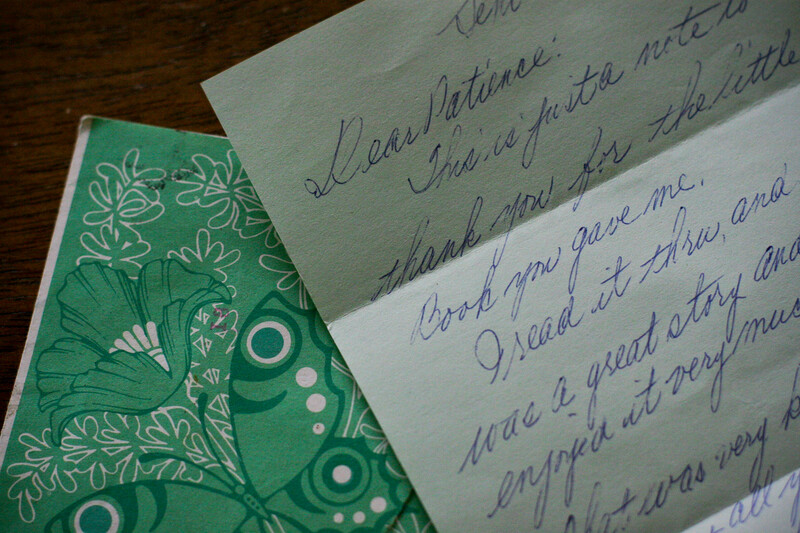 It was written on old Current stationary with green butterflies, like the kind my Gram always had in her old desk. I burst into tears as I read…I didn’t remember it at all, it was like reading it for the first time. I could actually feel the covering over me, one that has been there my whole life but feels more sacred than ever. Sent in September 1981 when I was 5. This is just a note to thank you for the little book you gave me. I read it thru, and it was a great story and I enjoyed it very much. no matter who they are or how they treat you. This gave me serious goose-bumps. oh, thanks Chris for sharing…I just love projects like that! How beautiful, it brought a tear to my eye too. Your Mom forwarded the above to me. Thank you so much for sharing Pop’s letter. Besides being my Dad he was my best friend. He always had a way of saying simple but heart touching thoughts that I have never forgotten. But most of all he lived what he believed i.e. Jesus. thanks uncle bobby for taking the time to write…much love to you. breath taking! your conscious mind may have forgotten but there it has been,in your unconscious mind molding your whole life! And you are passing his blessing on. Thank you. Oh, goodness, I have chills down my arms and tears in my eyes. What a beautiful, beautiful piece of your life. i just spent two weeks photocopying my grandmother’s recipe cards from her recipe book because i wanted them in HER handwriting. so, so good. like he knew before you did. Oh mama! I wish you were here. I would so hug you. thanks for the cry… the good cry. I needed it. thank you everybody for sharing this sweet memory with me, it’s the kind that means even more when you have someone to tell…especially people you care about, strangers and friends alike. I’ve come back to read this a number of times. This just takes my soul out for a little road trip in a convertible with the top down. I burst into tears as I read this. As someone else said, your grandfather knew you before you did – he recognized the kindness in you even then. Just last night I had a very moving dream about my grandmother (who has been gone for more than twenty years) and woke up crying, because she was clearly guiding me towards something new and different – and a little scary – in my life (and away from something else I need to leave). These special people can leave such a lasting impact and legacy in our lives. OMG!! This is powerful! He knew who you would be back then, almost the same age as your little Lucy! And you find it right when you need it most. Don’t ever doubt the positive power and influence you make in the world. You ARE kindness girl! I love you and I know I would have loved your grandpa too!